Souffle: Preheat the oven to 400 degrees F. Lightly grease an 8-inch square baking dish. 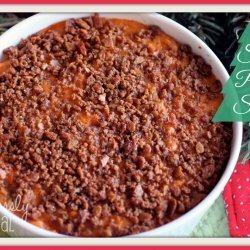 In a large bowl, combine the sweet potatoes, sugar, eggs, milk, butter, vanilla, and salt. Pour the mixture into the prepared baking dish. 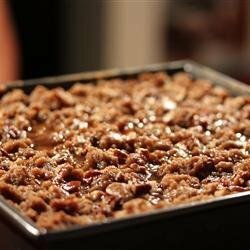 Topping: Combine the brown sugar, butter, flour, and pecans in a separate bowl. Crumble the topping over the sweet potato mixture. 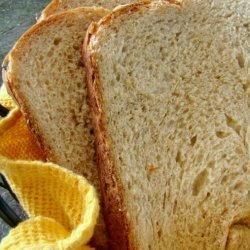 Bake for 20 to 25 minutes, until the topping is golden brown. Serve hot. Cooked mashed sweet potatoes, Sugar, Eggs, Milk and 6 more.. Butter, softened and divided, Rum, Light brown sugar and 11 more.. Chopped pecans, Butter, softened and divided and 10 more.. 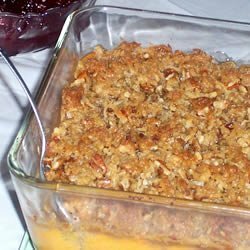 Baked mashed sweet potatoes, Sugar, Beaten eggs, Milk and 6 more..
Brown sugar, Butter, cubed, Light corn syrup and 12 more..
Brown sugar, Butter, cubed, Light corn syrup and 13 more.. Butter, melted (1 stick), Graham cracker crumbs and 14 more..
Light brown sugar, Softened butter, Flour, Chopped walnuts and 6 more.. Butter, at room temperature, plus more for pan and 12 more..
Granulated sugar, Eggs, Milk, Butter or 1/2 cup margarine and 13 more..
Granulated sugar, Eggs, Milk, Butter or 1/2 cup margarine and 12 more.. Butter, softened plus, Butter, softened and 12 more..
Eggs, beaten, Milk, Sugar, Vanilla extract and 11 more.. Butter, Granulated sugar, Egg, Baking powder, Cocoa powder and 6 more..
Sweet potatoes, peeled, cooked and mashed, Sugar and 8 more.. 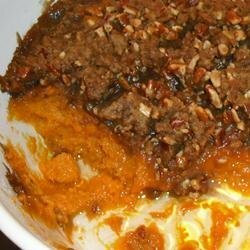 Lean ground beef, Tomato paste, Chopped vidalia onion and 8 more..
Sugar, Cornstarch, Boiling water, Orange juice and 2 more..
Mashed sweet potatoes, White sugar, Butter, softened, Eggs and 7 more..
Sweet potatoes, White sugar, Milk, Melted butter and 7 more.. 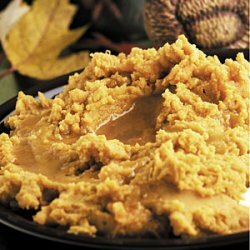 Steam and mash sweet potatoes (recommended: ore-ida) and 9 more..
Water, Vegetable oil, Brown sugar, Salt, Bread flour, Oats and 1 more..